More than 3,000 teddy bears are needed for the eighth annual Teddy Bear Round-Up, "Show You Care ... Share a Bear," taking place at Pearlridge Center Uptown Centerstage from 10 a.m. to 2 p.m. April 2. Bring a new or gently used teddy bear or stuffed animal to be distributed statewide to family shelters, children's hospitals and other organizations that help families and children in crisis as part of a month-long series of events observing Child Abuse Prevention Month in April. The goal of Prevent Child Abuse Hawaii, the Hawaii Chapter of Prevent Child Abuse America, and Partners for Prevention on Prevent Child Abuse Hawaii is to collect 3,868 teddy bears, representing the number of confirmed child-abuse reports in the islands last year, according to Elsie Foster, round-up co-chairwoman. The first 1,000 families to make a donation will receive a gift and child-safety information. Afterward, enjoy music and entertainment, and visits with Winnie-the-Pooh and other costumed characters. For more information, call 951-0200. 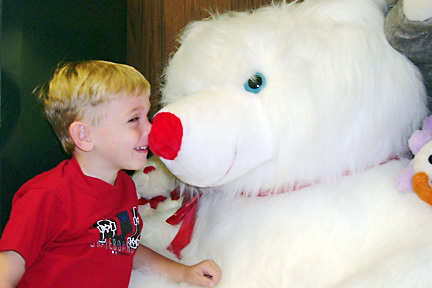 The first 1,000 families who donate to the teddy bear drive will receive a gift. The Honolulu Gospel Ensemble will be hosting auditions tomorrow at the Salvation Army building at 296 N. Vineyard Blvd. The ensemble, a volunteer choir with professional standards, is looking for men and women, 18 or older, who can sing. Auditioners are asked to prepare a song to demonstrate vocal quality. Call Freddy at 864-6926 for details. Tryouts have been set for the Lanikai Mortgage Players production of "Wild Bill and Calamity Jane, or How the West Was Almost Lost," Nelson Shreve's classic melodrama set in frontier America. All company invites all theatrically minded residents to audition, particularly those skilled in the art of overacting and rhetorical hyperbole. Show up at 7:30 p.m. April 5 at the Lanikai Park pavilion. » Calamity Jane: A frontier woman who often dresses like a bullwhacker. » Wild Bill Hickok: A Western legend who shoots to kill, then combs his mustache. » Dora: The only female saloonkeeper on the wild frontier. » Goldie: Dora's winsome daughter. » Gen. Custer: A world-renowned Indian fighter. » Private Buck: The General's handsome orderly with a secret. » Billy the Kid: A Wild West wannabe from Hell's Kitchen, New York. » The Buffalo Girls, Purina, Pillsbury and Hominy: The last of a legendary breed. » Senator Snort: A pork barrel legislator in the finest tradition. Backstage workers are also needed, as is help with popcorn, soft drinks, tickets, makeup, setup and props. For more information or to volunteer, call Lucille Shreve at 262-5577 or Roger Tansley at 262-5482. Surprise your Easter Brunch host and pick up a haku lei or floral arrangement at Victoria Ward's 25th annual anthurium plant show and sale. Prize-winning anthuriums will be on display with some offered for sale along with orchids, gardenias, haku lei, corsages and floral arrangements. The show runs 10 a.m. to 8 p.m. today and 10 a.m. to 4 p.m. tomorrow at Ward Warehouse, Ewa end. Free horticulture workshops will also be offered beginning at 10 a.m. both days at the Ward Warehouse Amphitheatre Stage. Windward Orchid Society presents its 26th annual "It's Raining Orchids" show this weekend at S.W. King Intermediate School Armory, 46-155 Kamehameha Highway, two blocks north of Windward Mall. It's a chance to see the largest collection of orchids on display under one roof, from 9 a.m. to 8 p.m. today and tomorrow, and 9 a.m. to 4 p.m. Sunday. Make a donation of $2 to enter. Call 239-5415 for more information. Drop by the Blaisdell Center from 9 a.m. to 2 p.m. tomorrow for the Lyon Arboretum Association's annual spring plant sale. The free event includes new plant introductions and demonstrations. Get set for the Bonsai Exhibit and Plant Sale being held 9 a.m. to 2 p.m. April 30 at Aiea Elementary School. The free event will offer some of Hawaii's finest bonsai for show and sale, with the opportunity to purchase pre-bonsai, stock materials, bonsai-related items, and house and garden plants directly from private collections. The club will also provide a bonsai advisory clinic. Call 262-5873 for more information. The following free do-it-yourself workshops are coming up in April at Home Depot stores throughout Hawaii. For more information, call the Home Depot nearest you, or 800-430-3376, or visit www.homedepot.com.